While island hopping and volunteering in the Yasawa Islands, Pat Kinsella sees a face of Fiji hidden from the big resorts. The bobbing head is barely visible above the waves and I momentarily fear our skipper will plough straight into the body lying facedown in the sea about 50 metres ahead of us. He’s clocked the situation though, and kills the throttle just in time. The woman in the water barely looks up. She’s one of a group, all wearing rudimentary diving masks and with eyes only for the ocean floor. They form an arc, about 500 metres from shore, and the one closest is intensely occupied with some strenuous-looking activity just below the surface. We pass close enough to get half a look at what she’s doing. Pondering the difficulty of such a hunt, which involves padding barefoot across a viciously jagged reef with little more than a stick for a weapon, I wave to the woman. She doesn’t wave back – unusual in Fiji, the most ridiculously friendly place I’ve ever stumbled upon in two-and-a-half decades of travel – but since her hands are engaged in an underwater life-or-death arm wrestle with an eight-limbed beast, I won’t hold it against her. The skipper guns the engine and we head further along the coast, where forests of thick palms are punctuated periodically by a scrape of golden sand and a tussock of huts indicating a small village. Bio pilots the dive boat away from Sunrise Beach, Barefoot Island. Skirting around a section of reef we encounter a man who appears to be levitating just above the water. On closer inspection I see he’s sitting on a kitchen chair attached precariously to a surfboard. He’s paddling this rickety contraption into deep water to go fishing, but pauses mid-stroke to wave. For Fran and her partner Mike – program leaders with Vinaka Fiji, a voluntourism project based in the Yasawas – this is an everyday commute, but for me it’s a glimpse at real life within the island communities of Fiji. We’re only a few hours by boat from the heavily visited islands around Viti Levu’s port of Denarau, but this feels a million miles from the scripted and sanitised version of Fiji I’ve seen many times in friends’ holiday photos. While thousands of holiday-makers annually flock to the Mamanuca Islands to enjoy neatly packaged, imagination-light, beach-based breaks, the slightly further flung Yasawa Islands offer the chance to explore a far less predictable, more exciting side of Fiji. 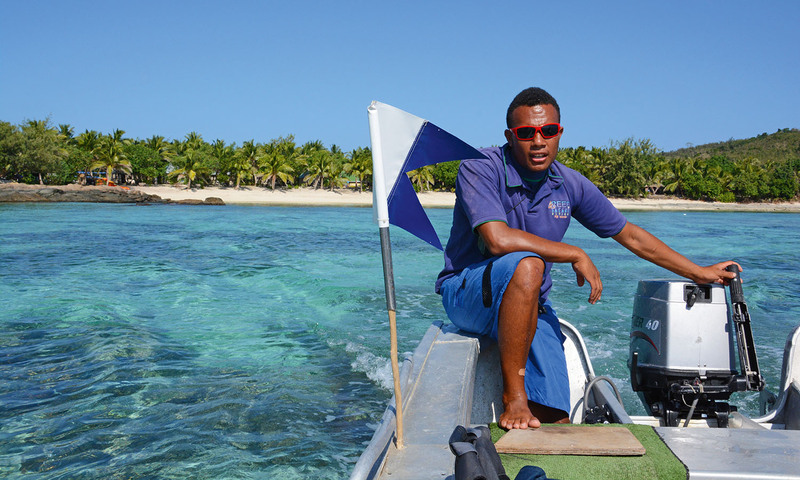 The Yasawa Flyer, a passenger-carrying catamaran, ferries travellers up and down the 20-island archipelago every day. Accommodation is still in lodges and resorts of varying sorts – rated via a coconut-based grading system (three coconuts being the best, one coconut the most basic) – but many of these are village owned and run, and because the islands are bigger and properly populated, there’s plenty of independent exploring to be done. Here you can experience a genuine cultural exchange, particularly through Vinaka Fiji, which sees volunteers donate their time and expertise to help raise the standard of living, health and education of the local population. There are 27 villages sprinkled through the Yasawa Islands chain, and their residents all exist below the poverty line. On our boat is Lorraine, a young schoolteacher from South London. For her summer holidays, rather than head to the beaches, clubs and pubs in places like Ayia Napa with her peers, she’s opted to volunteer here in a school and baby clinic. “It’s such a great way to experience a different culture from a unique perspective,” she says, before pointing out there are plenty of benefits to working in the Yasawas, even if you’re not being paid. Besides earning that warm fuzzy feeling of having contributed something to the community, the volunteers get to enjoy Barefoot Island alongside general guests. As well as the all-round idyllic nature of tropical-island life, these benefits include doorstep access to world-class diving and snorkelling, the chance to swim with manta rays almost daily and the opportunity to go night snorkelling, abseiling or sea kayaking whenever the urge arises. The bar is lively most nights, and the company is entertaining, whether you’re sipping kava with locals as the sun goes down, or trying your hand at Fiji Bitter–fuelled coconut bowling with a bunch of Scandinavian backpackers. My trip began near the top of the archipelago, on Nacula Island. My bure at Nabua Lodge was a basic one-coconut affair, but Nacula’s Blue Lagoon delivers a truly sensational beach experience, with no crowds. I’m a restless beach bum, though, and far more interesting for me was a visit to Nacula Cave exploring limestone caverns, including one that’s only accessible via a leap of faith and a very dark swim through an underwater tunnel. From there I’d holed up in a three-coconut joint at Botaira Beach Resort on Naviti Island, where, 10 metres from the door of my beachfront bure, I could plunge into some of the best reef snorkelling I’ve ever experienced. It was brilliant, but I’m eager to explore Yasawa life more deeply by the time I meet the Vinaka Fiji crew. Arriving at Kese Village beach we leap into knee-deep, gin-clear water. At the local school, Vinaka Fiji volunteers have been busy building new facilities for the kids, including a playground that’s being noisily appreciated when we arrive. Mike shows me around the village, where the project’s helping hand is apparent everywhere, from the installation of a huge rainwater collection tank to the planting of new trees. By the time we arrive back at the boat, school has finished for the day and the children are all at the beach, swimming and squealing under the late afternoon sun, with adults happily looking on. This place may be poor, but there’s no shortage of happiness. During the boat trip back we see the women from earlier – now on dry land and each bashing the life out of an unfortunate octopus on the beach. They return my wave this time. Over the following days we visit a number of villages along the coast, to participate in a mother-and-baby clinic on one occasion and to tour a secondary school hosting a sports day on another. Bouncing over the waves on the way back from one of these visits, Fran tells me about the wreck of a World War II plane that’s rumoured to lie on the seabed nearby. She and Mike are planning to dive down and explore it sometime soon. Now that’s a project I’d volunteer to be part of any day of the week. In the meantime, however, we have a different diving mission to complete. Volunteering for Vinaka Fiji isn’t just about education and engineering projects – there’s also a fragile reef that needs protecting here, and one way to help out is by cleaning clams. Now I’m no marine biologist, but I’d always assumed clams could look after their own personal hygiene, but Dan, Barefoot’s resident divemaster (who is a marine biologist), corrects me. These particular molluscs have just been reintroduced to the region, he explains. Their great skill is the ability to process thousands of litres of water a day as they filter feed. This voracious appetite for brine soup makes clams ideal frontline warriors in the fight against the dreaded crown-of-thorns starfish, which releases millions of eggs every day. Because they reproduce by the gazillion and leave a trail of devastation across reefs wherever they go, crown-of-thorns are persona non grata around here. To protect them from predators, young clams are kept in cages, meaning they can’t be cleaned by fish. That’s why, armed with an old toothbrush, I find myself in scuba gear kneeling on the seabed at about five metres, scrubbing baby shellfish. When the job is done, I have plenty of gas left to go and explore. As I drop another eight metres, a sunken boat suddenly looms into view. Unusually for a wreck, this one’s story has a happy ending. It’s known as the Wobbegong and inside it are the program’s success stories: mature clams, all busily chomping on starfish eggs. The Dive Shop – run by Reef Safari, which owns Barefoot Island – plays an active part in the Vinaka Fiji program, and numerous dives are conducted specifically for the purpose of exterminating crown-of-thorns starfish. But there’s plenty of pure pleasure diving here too, including an impressive shark dive. One morning, during an exploratory dive, we completely circumnavigate a small island while underwater. This plus a dive at the Caves of Babylon that features multiple swim-throughs are among the best bubble-blowing experiences I’ve ever had, but it’s an encounter that takes place above water that lingers with me longest. We’re hovering over our dive site in the manta channel as a boat speeds past. Our skipper extends a wave and the guy standing at the front waves back. Something is wrong with this picture though, and it takes me a few seconds to work it out. The driver of the boat has his face completely covered by a shirt and a pair of sunglasses. It lends him the look of a smuggler. As it turns out, that’s exactly what he is. It seems the marine animals are destined for Asia. Rumour has it a ship sits offshore with refrigeration facilities for the haul, supplying untrained divers with tanks and paying them big cash for cucumbers. 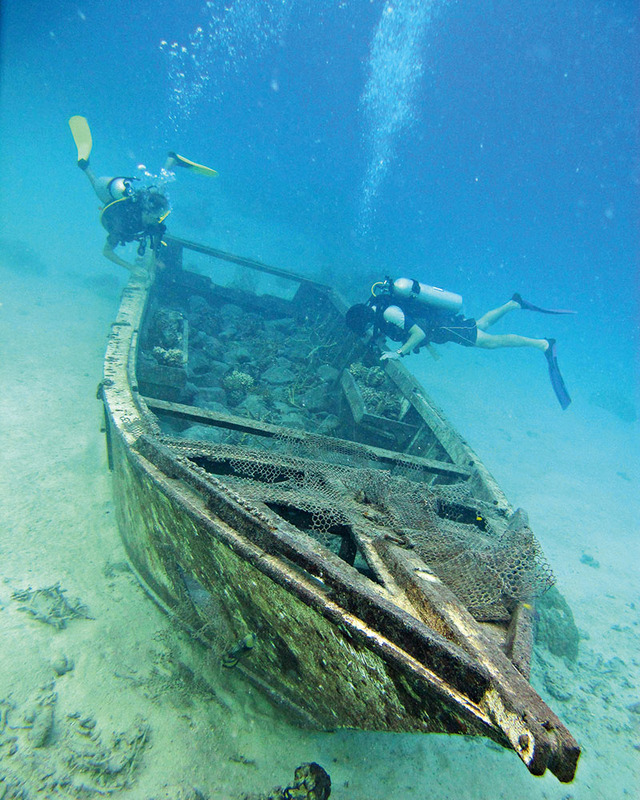 There have been many deaths among young guys in the villages – one the week before I arrived – and Reef Safari is sending its staff into the schools to educate kids about the dangers of diving without proper training and equipment. According to divemaster Dan, the area is about to be declared a marine park and protected, but it’s unclear how effectively it could be policed. If it were up to me, I’d send in the octopus huntresses to deal with the poachers – they don’t take any prisoners. Fiji Airways flies from Sydney, Melbourne and Brisbane to Nadi. Awesome Adventures Fiji offers a wide range of options for travel and accommodation throughout the Yasawa Islands, from tickets to one destination through to the Bula Pass, which is available for periods of five to 21 days and allows you to island hop and build your own adventure. These passes start at around US$210 (valid five days, transfers only). Volunteering programs (inclusive of accommodation at Barefoot Island Resort) can be arranged through Vinaka Fiji. The education program starts at US$910 a week. The marine conservation program starts at US$1400.